Want my Secret Magic Trick for Building Your Sales Funnel? Get your funnel built Today, even if you think you’re not tech-savvy. From the desk of Jessica Hansen, Systems Magician. If you want to get Automagic Results with your online business, this will be the most important book you'll ever read. But first, Let me tell you how YOU can build and launch your new sales funnel to make sales starting TODAY. I have built these exact funnels that I reveal for you in my book. In fact, I build them over and over for my clients, and they get results. My client used one of the funnels I built with this blueprint to fill an in-person workshop last month. One of these funnels I built for myself QUADRUPLED my own email list in less than a month. More pre-qualified subscribers = more sales. How do I know this will work for you too? Because it’s not over-complicated. Let’s face it, most of the ‘funnel blueprints’ I’ve come across online are pretty complicated. Have you noticed that too? Really, what you need is one straightforward and focused sales funnel to build your list and make convert those subscribers into paying clients. I can guarantee this is different from the other ‘blueprints’ you’ve seen. Those others are written in a way that’s meant to confuse you. My book is no-fluff, easy to read, and exactly what you need to know. You can rest assured, this funnel has been built time and again and it works. At 68 pages, you can read it, and IMPLEMENT it, in an afternoon. And It's About MORE Than Just a sales funnel. See, you can use the same formula in this book to sell all kinds of high end products and services. For example, I've also used the same system to get sell one of my books into Best Seller status on Amazon. One of my clients recently used the same strategy in the book to fill a workshop of high-paying attendees (she made well over 5-figures from one workshop). A client in the Coaching industry is using the same strategies to sell out her 1:1 program ($10k each) ...and then using the same strategies to turn those coaching clients into Mastermind members. A list of all of the pieces you need to have created to set up a fully functioning funnel. Exactly how to connect them together to make a seamless experience for your clients. My knowledge and experience wrapped into a single magic formula. But you know what you'll really love? Having the Confidence to Take the action that’s been paralyzing you. I’ve taken the mystery of what steps to do in what order and how to connect the dots. You can do this, step by step. I remember the first funnel I built. You’d laugh if you saw it now! I promise, it really was that bad. But you can use my knowledge and experience to skip through all of the mistakes I made along the way. When you use this Magic Funnel Formula, two things will happen. First, you'll be of genuine help to everyone who comes through your funnel. You’ll be reaching more people to share your message with, faster. Your smooth conversion process will give them the experience they need to view you as a trusted friend and advisor...regardless of whether or not they buy anything. This is really important to you because it sets you up for a long-term relationship with them where they're significantly more likely to become a good customer that does business with you for years, or they refer their friends to you. You'll start to make more sales! And you'll do it without having to manually move people through your business, you won't have worry about things being disconnected and not delivering, and you won't even have to talk about yourself or your services much at all! The "cost" of this e-book is $9.99, and you get it instantly as a download. You can access it anywhere, immediately, without having to wait for the mail. And I know there are some websites out there that offer you a great deal on something but then only give you the most basic of information you need, and then they sell you piece by piece until you’ve spent way more than you meant to. There's NO hidden "secret" you have to have later to make this formula work. I'm literally giving you this entire book and formula, for $9.99, as a service to you. My hope is that you'll love it and this will be the start of a good business relationship for years to come. You have just 72 hours to take advantage of this offer before it disappears. 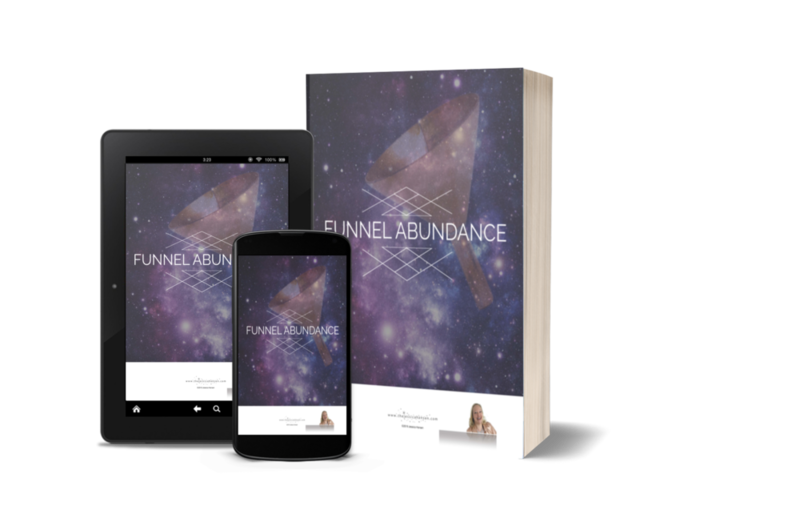 Send Me The Funnel Abundance EBook. You get BONUS access to the Funnel Abundance Mini-Course ($47 value!). There is no "catch" to this offer. You will not be signing up for any "trial" to some monthly program, or need piece after piece to make the formula work for you.